Dunfermline Athletic defender Andrius Skerla admits to anger at the collapse of his £200,000 transfer to Russian side Ruban Kazan. The Lithuania international had waved goodbye to the fans against Motherwell. "At that time, it looked very real that I was going to move because I had spoken to this team's manager a couple of times," the told the Pars' website. "It looked very real that I was going to leave. I am annoyed, disappointed and very angry." 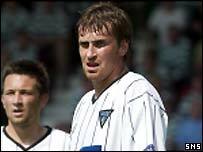 Dunfermline agreed a fee for the transfer, but the Russian club failed to come up with the cash. Skerla, who arrived from PSV Eindhoven in 2000, now looks likely to remain at East End Park for the rest of the season at least. "To be honest, I found out about a week ago that it might not happen and now I must concentrate just on Dunfermline," he said. "I want to forget that as quick as possible. I still have another season here." Skerla has had five seasons with Dunfermline and appeared to simply relish the idea of a new challenge, rejecting suggestions that his motivation was family reasons. "I don't know where that came from or how the chairman found out about that, because I never spoke with him," he said. "Of course, we have had some hard times in our family; my father-in-law died a couple of months ago now. "It is a hard time for my wife as well, but she never mentioned that she wanted to go back. It is normal when you lose a father or father-in-law."